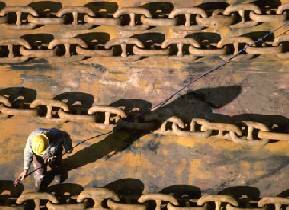 The biggest anchor chain diameter is 150 mm. Circumference of rod is about 47 cm, same as young girl's west size. Out side length is 900 mm and outside width is 540 mm. The weight of one link is 270 Kg, and 90 feet is 12 tons.